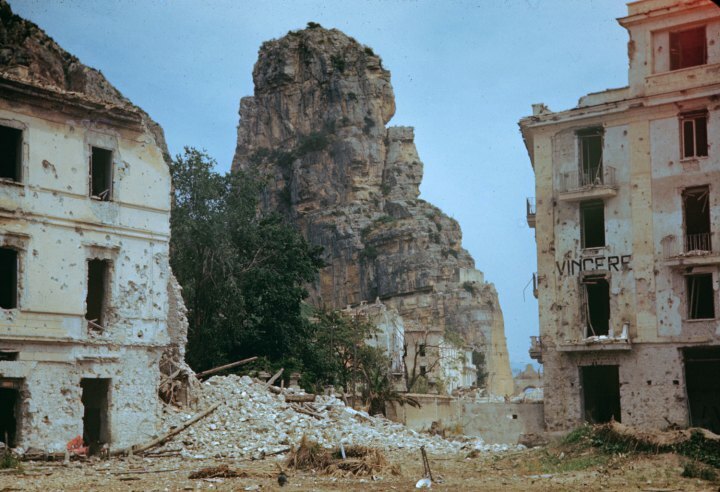 After WWII, Italy was poor, the roads were torn up by war, and the new democratically elected government was prohibited to build military hardware. Industrial revitalization was a must. So innovative militarists turned to consumer products to employ workers and restart the economy. The Vespa (“Wasp” in Italian) grew out of this era. It was designed and built by aerospace engineers to satisfy postwar transportation needs economically. They created a scooter, with all the mechanical parts enclosed, and a tall frontal splashguard, features which appealed to Italian men in suits and women in dresses. There was no grease to splatter on well-tailored woolens, and the versatile, small, well-engineered bike travelled well on narrow, pockmarked streets. Piaggio & Co. introduced it and still owns and manufactures Vespa. After its debut in 1946, it sold slowly, if solidly. 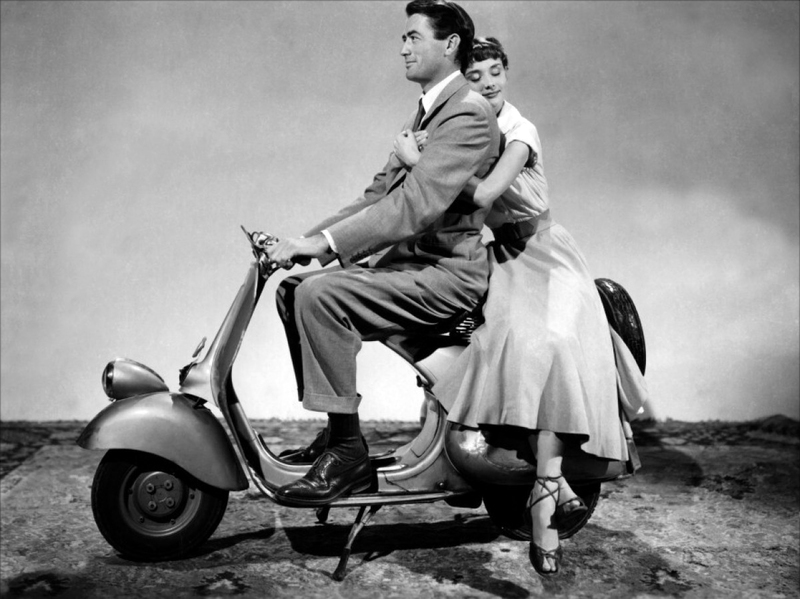 Then “Roman Holiday” (1952) starring Gregory Peck and Audrey Hepburn, filmed on location in Rome, skyrocketed the Vespa’s popularity. Suddenly 100,000 a year were selling. 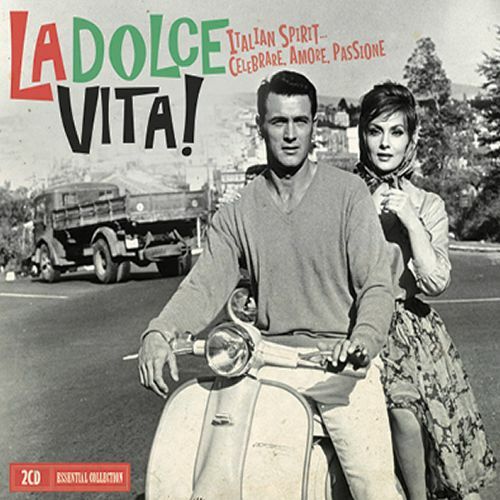 The popularity of films such as “La Dolce Vita” (1960) and the neo-realist Italian cinema of the 50s and 60s made all things Italian seem fast, young and glamorous. 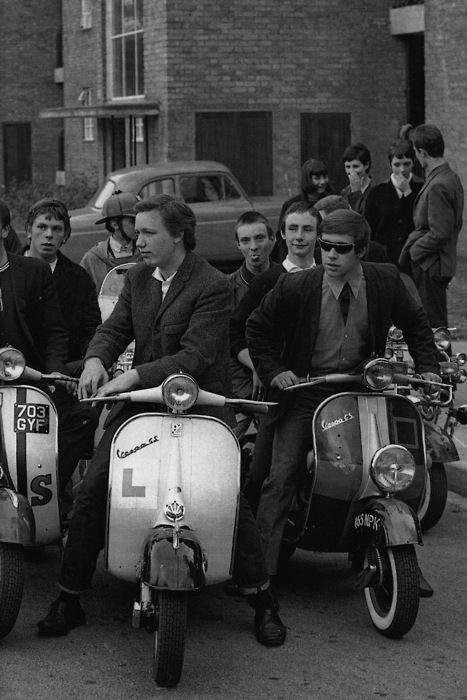 The mid 1960s Mod Subculture in Britain, dudes in Ben Sherman shirts and skinny ties and tapered trousers, furthered pushed the Vespa into pop culture. In the US, even Sears imported Vespas and renamed them Cruiseaires. By 1981, the bike had lost popularity due to environmental laws. 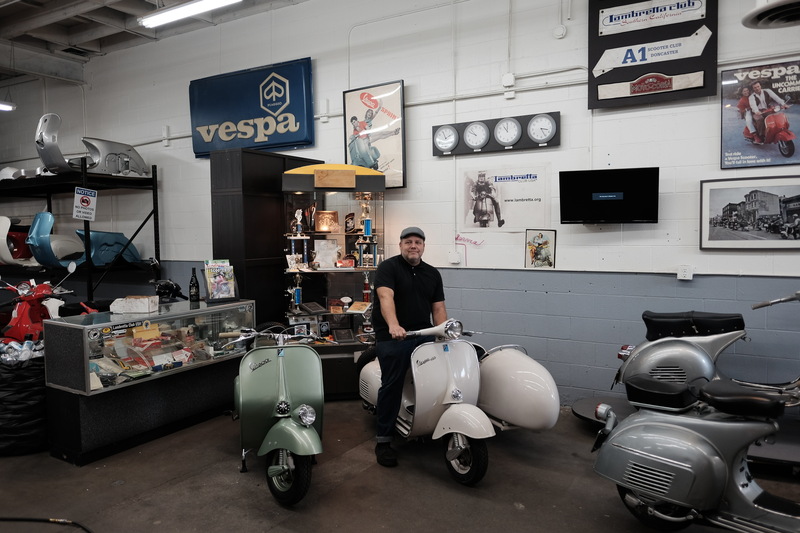 Yet again, in the early 2000s, Vespa restarted its American sales effort, opening its first boutique on Ventura Boulevard in Sherman Oaks, CA hoping to capitalize on our four CA freedoms: sunshine, mobility, novelty, and fun. According to Wikipedia, there have been 34 different versions of the Vespa. Today, five series are in production: the classic manual transmission PX and the modern CVT transmission S, LX, GT, and GTS. 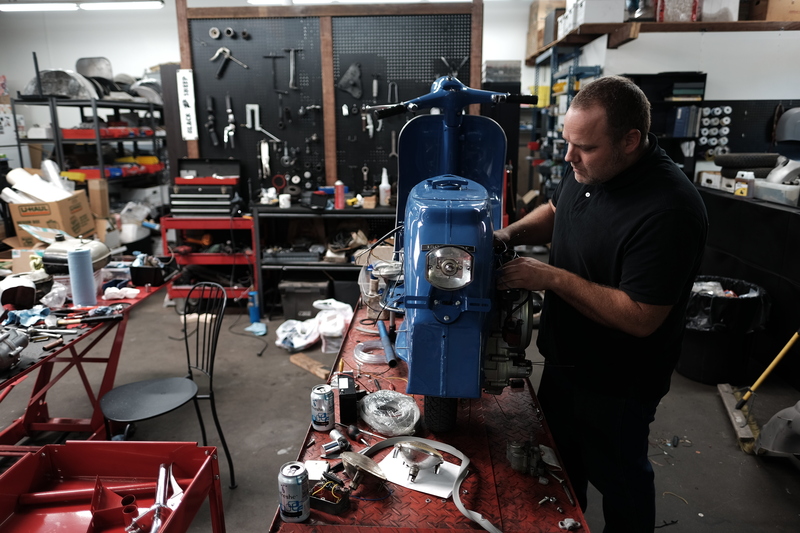 About 4 miles north of the Vespa retail store, at an unmarked building at 14819 Aetna St. in Van Nuys, Kristian Storli, 39 is quietly, diligently and artfully restoring Vespas, at his company, Bar Italia Classics, established 2006. According to Mr. Storli, it is the only shop of its type from here to Pennsylvania. 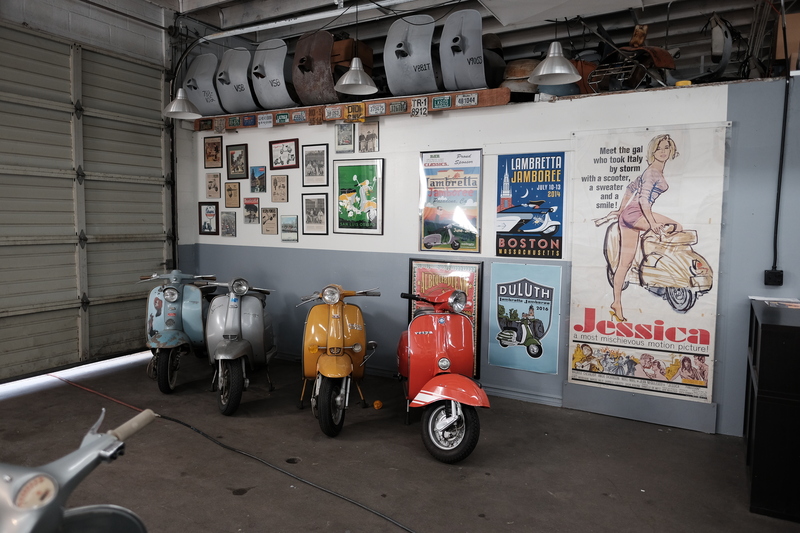 You pass through a gate into a courtyard packed with tools and bikes, all under some sort of repair, but then you enter a stylish, air-cooled, gray-painted, 3600 SF shop, unlike any you’ve ever been to, with vintage illustrations, glass shelves filled with awards and medals, antique framed advertising for Vespas, and a very large movie poster of Angie Dickinson atop a Vespa in “Jessica” (1962) directed by Jean Negulesco. 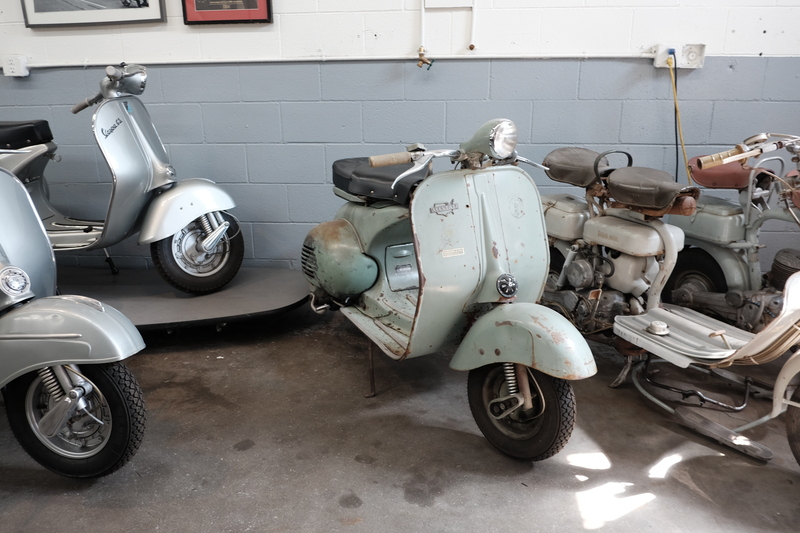 Obsolete is what haunts Mr. Storli, a stocky, blue-eyed, mechanical minded man of Norwegian descent who went to school to study musical composition, and ended up investing his life savings into his Vespa passion. He has had three shops in the last ten years: first on Calvert, then Bessemer, and now Aetna. C, B, A….. Ominously for him there is no letter preceding A. Each time, rents and leases ended. And this time, he fears, he may become redundant by Option A, if his shop, and 185 others are demolished by Metro Los Angeles for a 33-acre rail service yard. 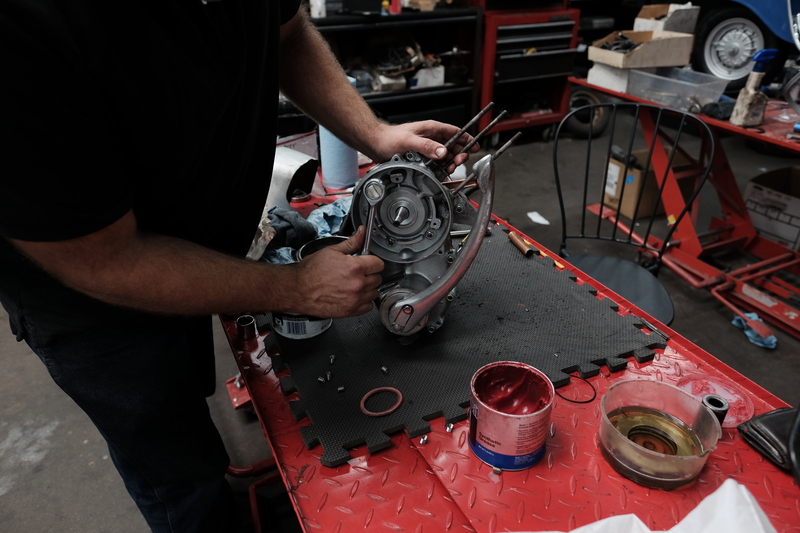 Reassembling the machine to peak condition in both function and appearance. Full payments are dependent upon delivery of the finished product to its owner. 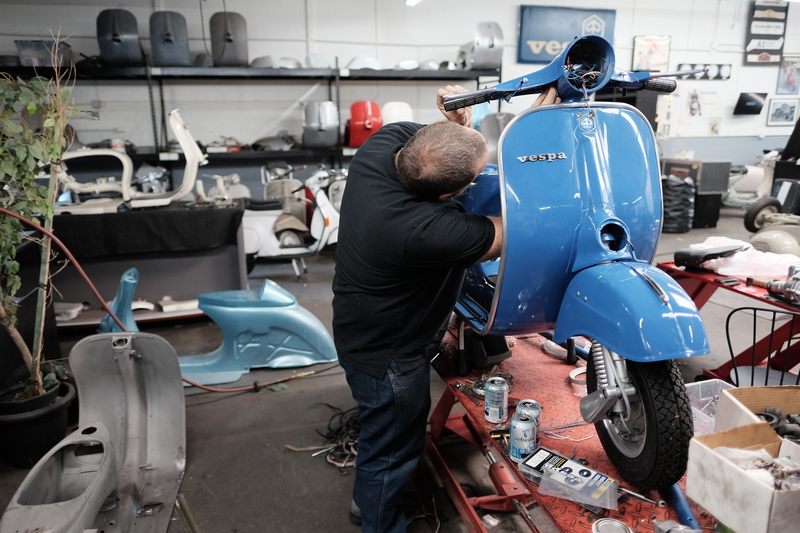 It is a painstaking job, only undertaken by devotees and acolytes in the cult of Vespa, but the result, as one can see in a finished product, is the absolutely breathtaking beauty of the timeless and completely Italian product. The smooth and shiny gracefulness of a finished bike exudes sensuality and speed. One day a few weeks back, working inside his dream factory, Mr. Storli was jolted with a bomb of an announcement: He might have to move to make way for a 33-acre demolition project bulldozing 186 businesses for a future light rail maintenance yard operated by Metro Los Angeles. He had only moved into his third, and presumably final shop, this year, 2017. He lost over a year of income when he had to move the second time. Now he was threatened with new economic ruin, not by a downturn in business, but by an aggressive action of a government agency using Eminent Domain powers to evict lawful enterprises. He told me that he is deflated, worried, and panicked. He has started, grudgingly, to look for other affordable space in Los Angeles. But the rental vacancy rate for industrial property is only one percent. And the competition is marijuana growers paying three times the asking rate to landlords. To lose so many businesses is sad. But it is doubly tragic to see a completely original and unique craftsman, Mr. Storli, thrown out of his space. It is one more step in the homogenization of Los Angeles, where shortsighted bureaucrats fail to protect unique and skillfully constructed products and services when they are operated by small businesses. But every corner store is CVS or Starbucks. We need excellent public transport. But grotesquely destructive and obliterating plans to build a light rail yard through viable and productive industrial tracts only harms Los Angeles -by destroying the real and the good -by promising the imaginary and the perfect.